What Day Of The Week Is September 12? 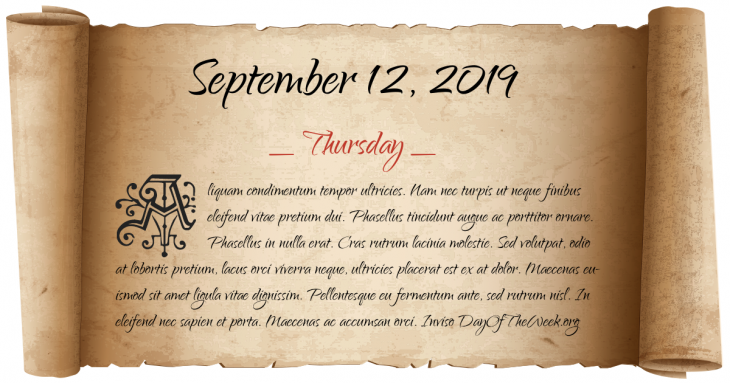 September 12, 2019 is the 255th day of the year 2019 in the Gregorian calendar. There are 110 days remaining until the end of the year. The day of the week is Thursday. Sixteen Kingdoms: Jin Xiaowudi, age 10, succeeds his father Jin Jianwendi as Emperor of the Eastern Jin Dynasty. Austro-Ottoman War: Battle of Vienna – several European armies join forces to defeat the Ottoman Empire. Switzerland becomes a Federal state. The Newport Transporter Bridge is opened in Newport, South Wales by Viscount Tredegar. Jack Kilby demonstrates the first integrated circuit. Indonesia is hit with an earthquake that measures 8.1 on the Richter scale. The USSR vetoes a UN Security Council Resolution deploring the Soviet shooting down of a Korean civilian jetliner on September 1. The 2008 Chatsworth train collision in Los Angeles between a Metrolink commuter train and a Union Pacific freight train kills 25 people. Who were born on September 12?